In 1800 Louis XVIII was 45. He had been friendly to reform in the beginnings of the French Revolution. But as it took a more radical turn, he had fled at the same time as the royal couple. Only he had succeeded in reaching Brussels when Louis XVI and Marie-Antoinette were arrested near the border. Since then, Louis XVIII had lived the unhappy life of an exile, at the mercy of the varying generosity of foreign sovereigns and the vagaries of international politics. In 1800 he was living under the protection of the Tsar of Russia. 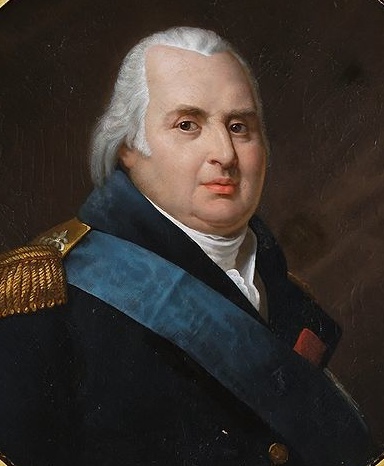 Louis XVIII was by all accounts, like his elder brother, a man of superior intelligence, but he was a far more astute politician than Louis XVI. He was patient, ambitious, cunning, and determined to step some day unto the throne of his ancestors. Many thanks for the link, Elena! I don't like Louis XVIII, but he certainly had a better claim to the throne than Napoleon. Louis XVIII was the descendant of the oldest and greatest monarchy in Europe; Napoleon, an ego in search of fame. One wished for peace for his country; the other did not care how many lives were to be sacrificed for glory and conquest. They will always remain for me such stark contasts in personality and breeding. One, aware of his heritage and the duty to bring peace and unity to his kingdom. The other, crude, violent and egotistical; a hot headed Corsican.